Global Friendship Ventures is the nonprofit organization which has grown out of a well-established ministry of the Tabernacle Church of Norfolk. This team is made up of people who love to serve and work with international students. Kathy Hardison is the director for Global Friendship ministries. She was the Director of the international student ministry at Tabernacle Church of Norfolk and served in that position from 2005 to 2009. She has worked alongside her husband for more than 35 years of ministry at Tab, assuming a variety of leadership positions. She has served on the board of TEAM for 9 years and has traveled broadly in order to support missionaries in their place of service. 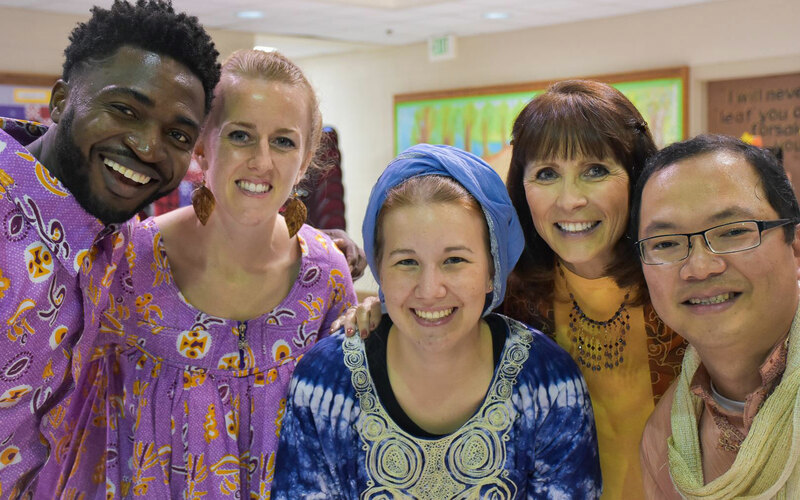 Involvement in ministry to international students has been a lifelong passion, one which has deepened the spiritual life of all the Hardison family members. Her husband is currently pastoring at Virginia Beach Community Chapel and their 2 adult children and 5 grandchildren are a vital part of ministry there. Kurnia Foe, Ph.D, is from Bangka. He accepted the Lord Jesus through a small group Bible study while a student at the University of Indonesia. He graduated with a master’s degree in Experimental Nuclear Physics and a doctoral degree in Electrical and Computer Engineering at Old Dominion University. Kurnia and his wife, Lian, have been involved in ministry since serving together in the campus ministry in Indonesia. As a team, they have been serving thousands of international students, scholars, and their families. God has blessed them with five sons: Joshua, Micah, Nehemiah and twins-Timothy and Titus. Kurnia is the first recipient of the MONARCH LEGACY AWARD (for founding Global Student Friendship and serving over 4,000 international students and scholars at the ODU campus) presented by Old Dominion University. Also, he was the first recipient of the TIMOTHY AWARD (for outstanding leadership among international students and scholars around the world) presented by the Association of Christians Ministering among Internationals. Allison Ambane has Midwestern roots and an international heart. After completing her undergraduate degree in Spanish and Cultural Anthropology, Allison was appointed as campus staff with InterVarsity Christian Fellowship serving specifically among international students. Since 2006, Allison has trained multiethnic teams of students in Christian leadership and campus outreach. In addition to serving on the campuses of Washington University in St. Louis and Lindenwood University, Allison has trained InterVarsity staff to plant new international ministries at other universities. Allison is a life-long culture and language learner. Allison studied as an international student in Spain and spent a summer doing volunteer work among refugees in Cairo, Egypt. As a staff worker, Allison enjoyed leading teams of North American students on lingua-culture exchange programs in North Western China. In 2014, Allison completed her Masters of Arts in Teaching English to Speakers of Other Languages (TESOL). In 2015, she moved to Norfolk, Virginia and got married to her husband Emmanuel Ambane Ambane. Currently she serves on InterVarsity staff at Old Dominion University serving international students. Emmanuel Ambane is originally from Cameroon in Central Africa. He came to the USA in 2006 when he was recruited on a soccer scholarship at Old Dominion University. Emmanuel played four seasons for the Monarchs and graduated in 2009 with a Bachelor of Arts in Economics. During His time at ODU he came to have a personal relationship with the Lord Jesus through Global Friendship. After graduation, Emmanuel had the desire to pursue a professional soccer career, but God re-directed his steps towards ministry. He began graduate school at Columbia International University to be better equipped and educated for cross-cultural ministry. He graduated from Columbia International University with a Master of Divinity in Bible Exposition in 2014. Emmanuel worked at Old Dominion University as a soccer coach and served International High schoolers at Ben Lippen School in Columbia, South Carolina as a houseparent. He has been part of the VBJ-1 summer outreach ministry to international students working in Virginia Beach since 2010. In January 2015, Emmanuel was appointed as a Virginia Beach Community Chapel missionary to Old Dominion University. Emmanuel is married to his precious Sweet Pie, Allison, who is an English Instructor and staff worker with InterVarsity Christian Fellowship since 2006. Our passion is to see students growing in their faith and to make God make known! Fé is a Third Culture Kid (TCK) who grew up partly in Europe and partly in the US. As an adult, she‘s spent time in Central and South America, worked with West African immigrants, and served international students in New York City. Though she looks like a student, she’s not! She graduated from ODU several years ago and spent a couple years in the workforce doing nursing. Being an ODU alumni with a love for travel and international students, Global Friendship Ventures is the perfect fit! Board of Directors serving on our team. Global Friendship Ventures is a 501(c)3 non-profit ministry working with international students attending Old Dominion University. Through activities, service and friendship, we have the amazing opportunity to engage future world leaders in meaningful conversations where ideas and faith are respected and explored.